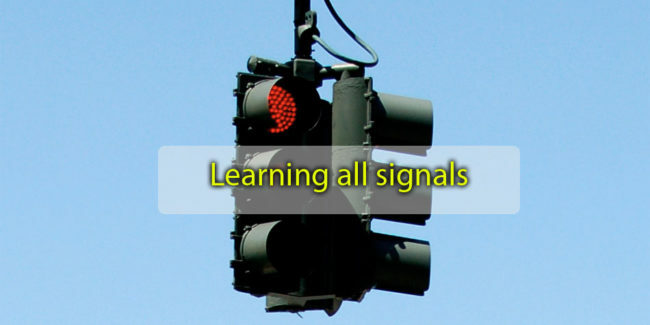 Learning the meaning of different traffic signal lights may seem pretty straight forward. Green means “Go”, yellow means “Caution”, and red means “Stop”. It’s easy, right? 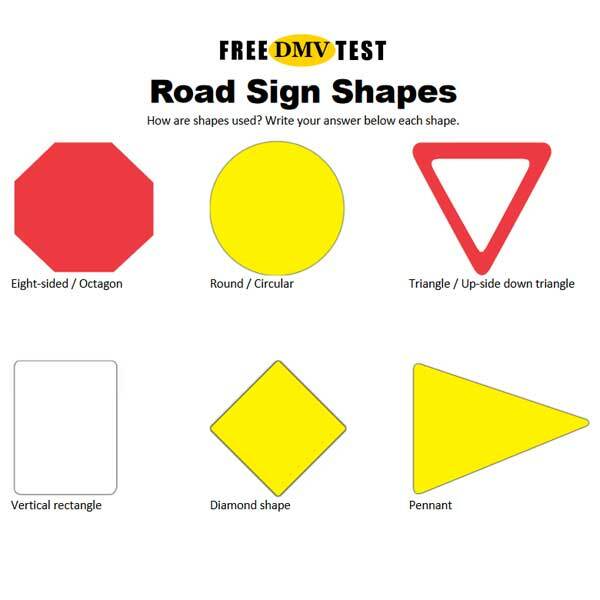 But that is not what DMV will ask you on the knowledge test. Questions usually go beyond the very basics. Make sure you understand all variants of highway traffic signals, what you can do and you must not do. Let’s start with the green light. The solid green light (green ball) means that you may proceed through the intersection and make a turn unless turns are prohibited by another signal or signs. If you are turning right, make sure you don’t cross the path of bicyclists or pedestrians. If you are turning left, you must also be aware of oncoming vehicles. Don’t turn if you don’t have enough space to complete the turn before any oncoming vehicle reaches the intersection. Before entering and intersection on the green light, you must give the right-of-way to any vehicle, bicyclist, or pedestrian that has lawfully entered the intersection. You must also avoid entering the intersection if you cannot get completely across before the traffic signal light turns red. If you block the intersection, you can be cited. A green light does NOT give you the right of way. The yellow traffic signal light means “Caution”. It warns you that the signal is about to turn red. During the “yellow phase”, vehicles are expected to clear the intersection. When you approach a yellow light, you should slow down and stop, if you aren’t too close to the intersection to stop safely. There are three different yellow light laws in the United States. The permissive yellow law allows you to proceed during the “yellow phase” if you don’t speed up to beat the red light or block the intersection. The other two are restricted yellow laws. Read about them here: Drive Against A Steady Yellow Light. Laws in all states allow you to proceed against the yellow light if you cannot stop safely. If you are to close to the intersection and other vehicles are following closely, proceed carefully against the yellow signal and clear the intersection as quickly as possible and safe. The red traffic signal light means “Stop”. You cannot proceed through an intersection when the traffic light is red. You must remain stopped until the signal turns green. The most common exception to this rule is the right turn on red. After coming to a complete stop and yielding to bicyclist, pedestrians and turning vehicles from the opposite direction, you may make a right turn on red unless a “No Turn on Red” sign is posted. This is true in all states. Local ordinances may, however, prohibit all such turns even if state law allows them. The most notable is New York City where all turns against red are prohibited. Most states also allow a left turn against a red signal if you are turning from a one-way street onto another one-way street. All left turns against red are prohibited by state law in Connecticut, District of Columbia, Maine, Missouri, New Hampshire, New Jersey, North Carolina, Rhode Island, and South Dakota. Again, local ordinances may override the state statutes. Question 3: Which light indicates that you must always come to a complete stop at an intersection? Red means stop. You must always come to a full stop. If turns against red are allowed, you may not make the turn before stopping and yielding. “A rolling stop” is not enough. For the yellow signal, see above. The red arrow is perhaps the confusing signal in United States. In some states the red arrow has the same meaning as the solid red ball, except that it regulates movements in the direction of the arrow. Turns that are allowed when the solid red light is displayed, are also allowed when the red arrow is shown. In other states, the red arrow has a significant meaning that differs from the solid red light. You may not turn in the direction of the red arrow, even after a complete stop. California is such a state. States that allow a turn against the red arrow under the same rules as the solid red light are: Illinois, Kansas, Louisiana, Maryland, Michigan, New Hampshire, North Dakota, Oregon, South Carolina, Utah, Washington State, and Wyoming. Look for the paragraphs explaining the red arrow signal in your driver’s manual. The purpose of the green arrow is to indicate protected turns. When the green arrow is shown, traffic from the opposite direction faces a solid red light. Under the rules of the red light, traffic from opposite direction may still make a right turn after stopping and yielding. Traffic in a left lane may also face green arrow allowing left turns from the opposite direction. Before turning on a green arrow signal, watch for other traffic and yield to vehicles that lawfully entered the intersection and haven’t yet cleared it. The green arrow means that your turn is protected by red signals – it does not give you the right of way. You must yield to vehicles that lawfully entered the intersection and are still in the intersection. A driver in the proper lane may turn in the direction of the arrow without stopping, if the way is clear. The yellow arrow basically serves the same purpose as the solid yellow light. It tells you that the protected-turn period indicated by a green arrow is ending. You should slow down and be prepared to obey the next signal. The next signal is not necessarily the red arrow. It can also be a solid red light (all lanes) or a solid green light (all lanes). The protected-turn period indicated by a green arrow is ending. The flashing yellow arrow was introduced to emphasize that turning is allowed but not protected. When the flashing yellow arrow is shown, oncoming traffic is not stopped by a red signal. Before turning against a flashing yellow arrow, make sure that oncoming vehicles aren’t a hazard and that you have enough time to complete the turn. A flashing yellow arrow indicates that turns are allowed and not protected. In some states, a flashing red arrow is used. Unprotected turns are permitted in the direction of a flashing red arrow only after coming to a full stop. The idea is that a full stop helps drivers to select a safe gap in the main flow of traffic. The signal following a flashing red arrow can be a steady red arrow, steady yellow arrow or solid red light. 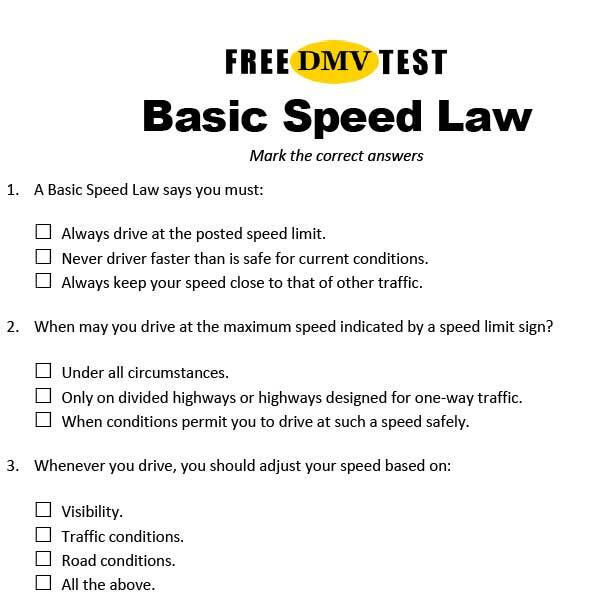 The most common DMV questions about traffic signals deal with the flashing red signal and the flashing yellow signal. If you remember that red means stop and yellow means caution, you should have no problem answering them correctly. A. Stop completely, only proceed when you can do so safely. The flashing red signal means you mean come to a full stop at the stop line. After yielding and making sure the way is clear, you may proceed. You don’t have to wait for a green light (there won’t be any). The flashing red signal has the same meaning as a stop sign. You must come to a full stop at the stop line. After yielding and making sure the way is clear, you may proceed. The flashing yellow signal tells you to be especially alert when approaching the intersection. You don’t have to stop (the flashing yellow signal is NOT followed by a red signal). Look left and right, then use caution before proceeding through the intersection. The flashing yellow light tells you to use caution when proceeding through the intersection. You don’t have to stop. During low traffic, signals can be turned off and just flash either red or yellow lights. Should this happen, you must follow the rules for flashing lights (see above). If signals are blacked out and not functioning at all, proceed as though there is a stop sign in all directions. Come to a stop, look in all directions, follow right-of-way rules, and go when it is safe. Laws differ between states and a full stop may not be required everywhere.